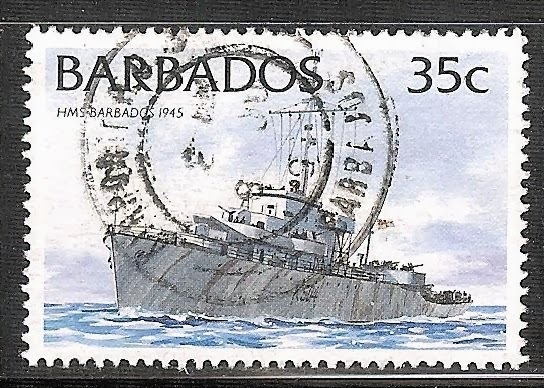 The Barbado's issued the 35 cent HMS Barbados stamp on August 16th, 1994 as one of a set of fourteen ships stamps issued. She was armed with Three 3"/50 calibre dual purpose gun mounts, two twin 40mm gun mounts, nine 20mm guns, one Hedgehog depth charge projector, eight Y-gun depth charge projectors and two depth charge racks. The Barbados had a complement of 190 sailors and officers. During her service with the Royal Navy the Barbados had two commanding officers: Lieutenant Commander Erik George Donald, RNVR and Lieutenant Arthur Horace Kent, DSC, RD, RNR.